Gone To the Dogs! A Wedding Celebration with Sunshine, Butters and Lennon! Oh, People, too! Randy and Lauren are a most gracious, loving and compassionate couple. And when you add in their “pack of 3” and their devotion to animals, you can understand why a big part of their wedding ceremony and wedding day included their beloved companion animals. 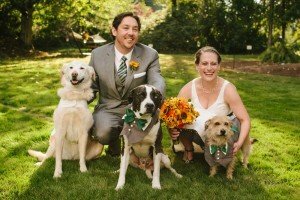 Married at their home on September 8th and working with Wedding Planner Extraordinaire, Lisa Chambers, Randy and Lauren designed a wedding day that truly celebrated their love for one other and their love for their furry family members. Wedding dogs, Sunshine, Butters and Lennon, made it down the aisle and stood as “witnesses” during the wedding ceremony. Toward the end of the ceremony, there was a “surprise” note from Sunshine that was read on behalf of her and her buddies to their much loved guardians! And let’s not forget the “get-a-way vehicle” and the many more thoughtful touches (invitation, amazing cake, catering stations) around the the celebration that made this such a memorable event. Randy and Lauren – with much love and a big WOOF, I wish you much continued happiness! Comments Off on Gone To the Dogs! A Wedding Celebration with Sunshine, Butters and Lennon! Oh, People, too!